Q-1 Where is the Bharat Heavy Electricals Limited situated? Q-2 On which day is ‘Green-day’ celebrated in Uttarakhand ? Q-3 How many Polytechnic colleges are there in Uttarakhand ? Q-5 Where is the agriculture universities in Uttarakhand ? Q-6 Where has the wild life protection training centre been established in Uttarakhand ? Q-7 Which of these is the Mini Switzerland according to Mahatma Gandhi? Q-10 Which one of the following cities is situated at river terraces? 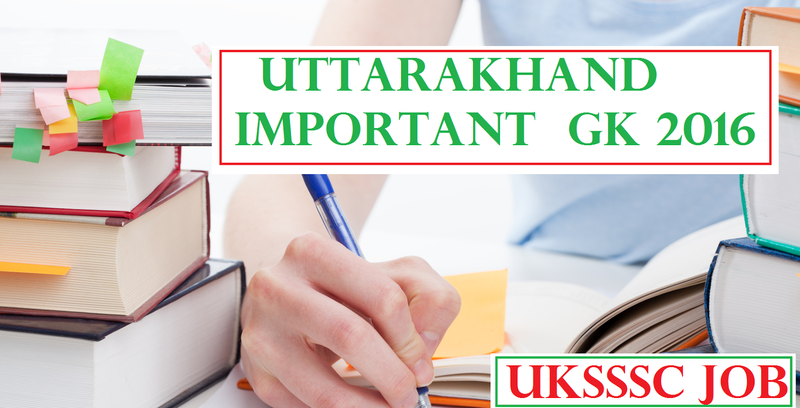 Q-11 What is the main cause of the formation of Uttarakhand ? Q-15 How many districts are there in Uttarakhand ? Q-16 Where is the Sahastradhara water fall ? Q-18 Which is the first state assembly to establish its separate website? Q-19 When was the Kumaon Council formed? Q-20 Which of the following passes is in Uttarakhand ? Q-21 In which region of Uttarakhand is ‘Nagrik and Soyam forest development project’ launched? Q-22 Where is the China peak situated? Q-23 Where is the maximum rice grown in Uttarakhand ? Q-25 Who was the leader of Utthan-Parishad in Uttarakhand ? Q-26 Dr. Pitambar Dutt Badashwal prize 2000, was awarded by Uttar Pradesh Hindi Sansthan to which literary person? Q-27 Chandi Prasad the dignity of Uttarakhand, was awarded the international prize, what is that prize? Q-29 What is Pindari ? Q-31 At which place does the Ganga enter the plains area? Q-33 Who was the first Chief Minister of Uttarakhand? Q-34 When did the earthquake occur in Uttar Kashi ? Q-37 Which one of the following is not the policy matter of New Industrial Policy of Uttarakhand ? Q-38 What is the total percentage of population having the age group of 0 to 6 in Uttarakhand ? Q-40 Who has been appointed the 1st Advocate General of Uttarakhand ? Q-42 Who was appointed the first Registrar General of Uttarakhand High Court? Q-43 Who is the first Chairman of the Public Service Commission of Uttarakhand ? Q-44 Who said “Ranikhet is one of the beautiful hill stations of Uttarakhand” ? Q-45 Who presented the 1st budget (State Budget) 2001-2002, on 3rd May, 2001 in Uttarakhand Vidhan Sabha ? Q-46 Where has an I.I.T. in collaboration with I.I.T. Switzerland been opened? Q-47 Who has the record of being Protem speaker for maximum period i.e. (46 days) ? Q-48 Who was the first Prime Minister to announce the formation of Uttarakhand state on indepences day? Q-49 At which place does river Bhagirathi merge with Alakananda ? Q-50 Where is the museum situated at Uttarakhand ?